Crashes at intersections cause the most fatalities than any other type of crash location. Not only are red light runners responsible for the majority of these crashes but also drivers making U-Turns are often involved in these type crashes. It is important that before making a U-Turn at an intersection, you know the law of your state. 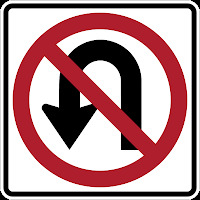 Some states allow a U-Turn at any intersection unless there is a traffic sign telling you No U-Turn allowed. Then there are other states where you can only make a U-Turn when a traffic sign says, U-Turn Permitted. Almost all states do not allow U-Turns over double yellow lines painted on the roadway. First, you can only make a U-Turn when the traffic light facing you is either a green arrow allowing the turn or a solid green light. Many people believe that because they are going to make a U-Turn and are a considerable distance from the center of the intersection they can make the turn while the light is red. This is a violation because you are still moving your vehicle into the intersection on a red light. Plan your U-Turn by looking for pedestrians or individuals riding bicycles. This includes checking for pedestrians and others when you turn into the opposite direction. Always look to your left and right before beginning your turn. If the light facing you has just turned green wait a second or two for possible red light runners approaching from another direction. It's a good idea to take your foot off the accelerator moving it closer to the brake in case you have to make a sudden stop while making your U-Turn. By keeping your foot closer to the brake, you will have a better chance of stopping your vehicle should an emergency arise. If you have entered an intersection when the signal light changes, complete your turn as soon as traffic clears. Never try to back up in an effort to avoid blocking the intersection. It is important that you remember you will always be making a U-Turn from the left portion of the lane closest to the centerline of the roadway. You may never make a U-Turn near the crest of a hill, a curve, or any other place where other drivers cannot see you from 500 feet away in the same direction. U-Turns may get you back to a location you missed and making a proper U-Turn assures you, you will get to your missed location with getting into a crash.